Waffle cones, waffle fries, waffle sandwiches - people seem to have an obsession with all things waffle. 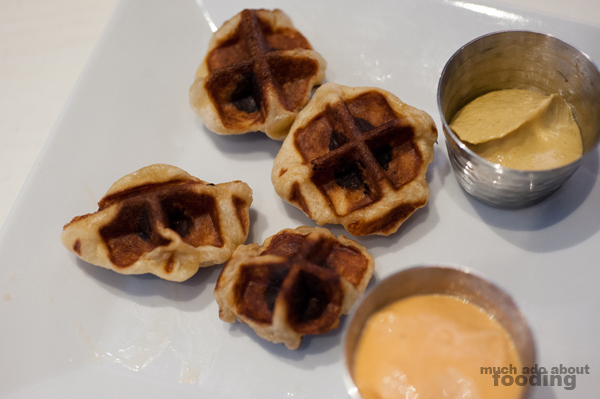 How about waffles with their accompaniments mixed right into the batter instead, whether savory or sweet? 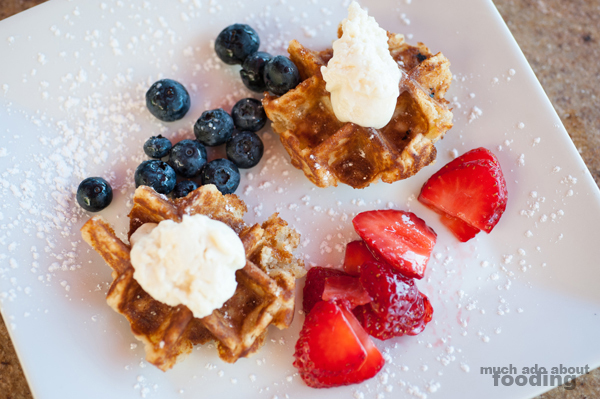 Inspired by the handheld, on-the-go waffle culture in Belgium, The Waffle Affair in Newport Beach sprung up to tackle this different style of battering up their guests - make everything right in the mix itself. Incorporating the ingredients directly into the batter allows for the 21+ varieties they serve to be presented in a more traditional Belgian way. However, if you are all about the toppings, those are options as well. We were invited to give some of their creations a try so we headed on down to the Bayside Center Shopping Center where they reside. 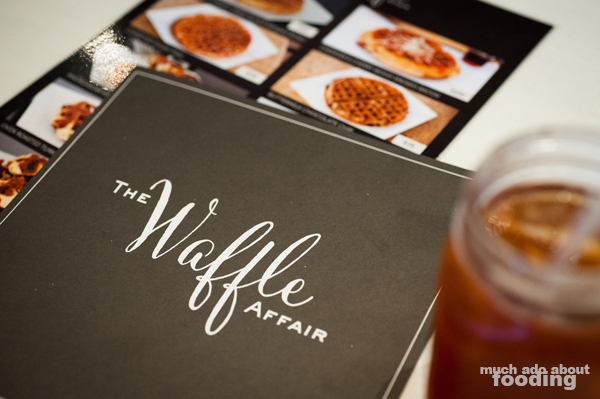 Right when you enter The Waffle Affair, you'll notice the chic, modern look with white tufted banquettes along the walls in the dining area. Chandeliers and textured mirrors contributed to a feminine look that made me also consider finding an afternoon tea to enjoy there. The gleaming waffle makers behind the counter caught our eyes though and reminded us that waffles were the affair hereabouts. Their menu was easy to consider and consisted of several regular classics but also featured seasonal flavors which we gave a try later on. 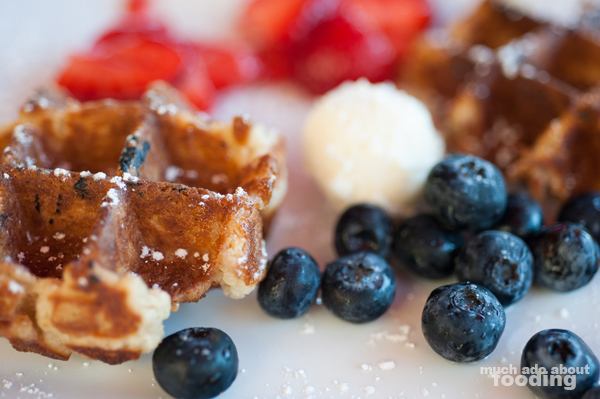 Approximately one-third of the menu is for savory waffles though so if you are seeking a fill-em-up sandwich type, you ought to be primed for sweets. 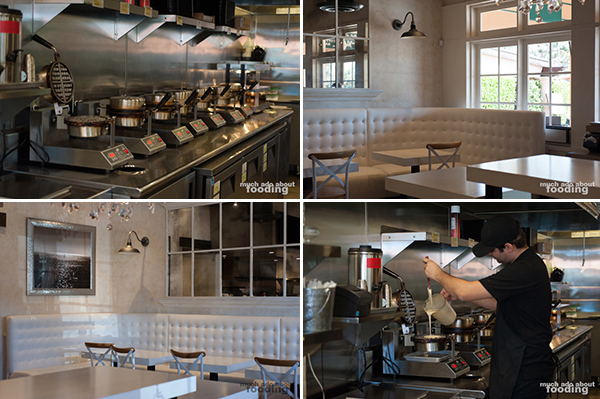 We were told that the batters are all different for the different types of waffles on the menu, with ingredients being added when the batter is made. Driven by demand, the types vary from dessert-like treats such as carrot cake and gingerbread to more hearty varieties such as prosciutto and gruyere. 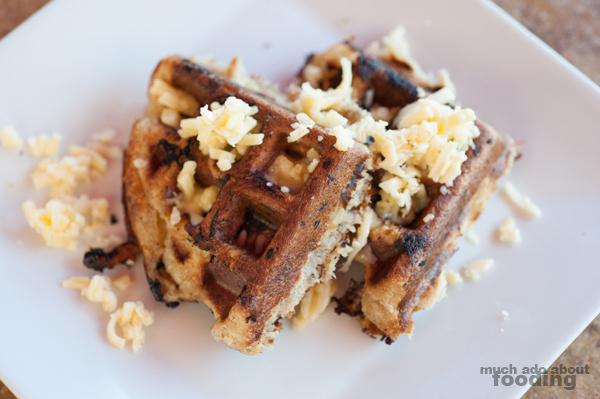 Due to frequent request, they have also added eggs, bacon, and sausage to the menu for those opting for classic waffles. 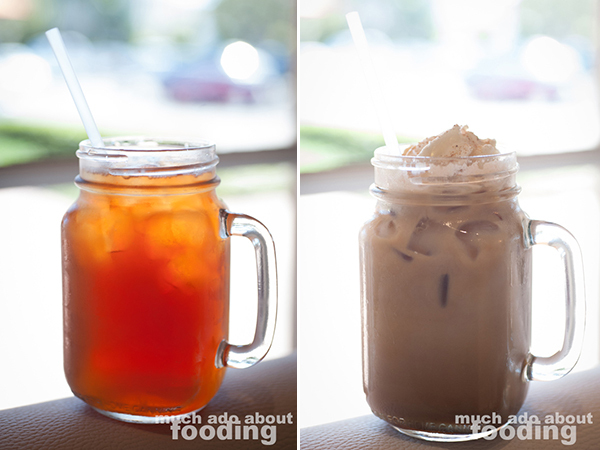 Additionally, The Waffle Affair boasts an illy coffee bar from which we partook in their Passionfruit Iced Tea ($3.25/16oz - brewed Dammann Freres) and Iced Honey Lavender Latte ($4.50/16oz). Refreshing and robust in flavor, both had good balance and great taste. We started off trying out the heavier items since this tasting happened to be a late lunch and early dinner for us. To begin, we had a mixed half-order of their Bits & Dips ($6.75 - breakfast sausage and maple syrup OR hot dogs and mustard or spicy mayo - 8 pieces), miniature waffles with either a short link of breakfast sausage or hot dog in the middle. It reminded me in concept of a corn dog. The batter was slightly sweet for these and offset by the different dipping sauces. It seemed like a fun plate to share with a group and convenient to nosh on. Their two best-selling savory waffles are the Prosciutto di Parma & Gruyere Cheese ($10) and Oven-Roasted Turkey & Havarti Cheese ($9.75). Bear in mind that ordering the former will not give cold prosciutto in its signature delicate texture; when mixed into a waffle, it got crunchy and became more akin to bacon. 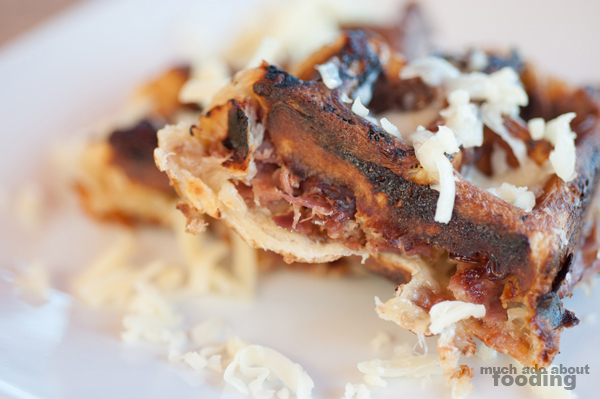 We actually found it to be saltier than preferred but melty Gruyere cheese could help out. The oven-roasted turkey waffle could have done with a dipping sauce or some type of smear after being made as the generously thick pieces of turkey were dry in some spots. The sweet waffles fared much better and were just about eaten up right away. We sampled their Toasted Coconut (rotating waffle), The Chocolate Chip ($4.75), and Lemon Burst (rotating waffle) dishes. The toasted coconut had a great batter that had some tropical influences in it, swaying on the sweeter side but speckled throughout with coconut pieces and a toasted scent to it all. The gooey chocolate chip waffles were a bit nostalgic back to the days of childhood chocolate chip waffles/pancakes for breakfast, and they were done well, oozing melted chocolate when broken apart. I was really fond of the lemon burst because of its zesty tartness that was a refreshing break from the heavy batter of some of the other dishes. This one seemed more airy as well so the light batter was a nice change of pace. 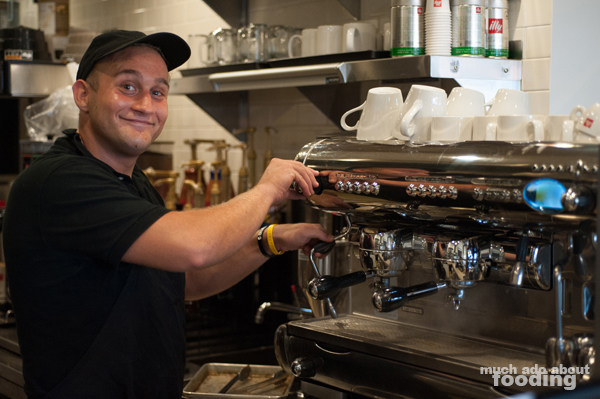 With each as well, we had additional toppings which they offer such as powdered sugar, maple syrup, and whipped butter for free; premium toppings such as seasonal berries, Nutella, cream cheese, and Callebaut Belgian chocolate sauce incur a small extra charge. 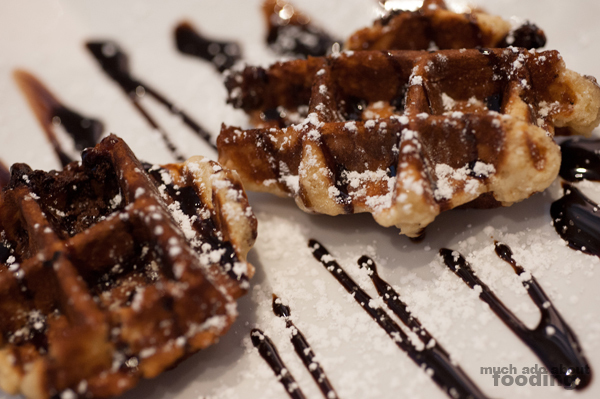 All in all, the concept is different here for their waffle dishes because of their ingredient incorporation but they certainly have won many customers over on their sweets. 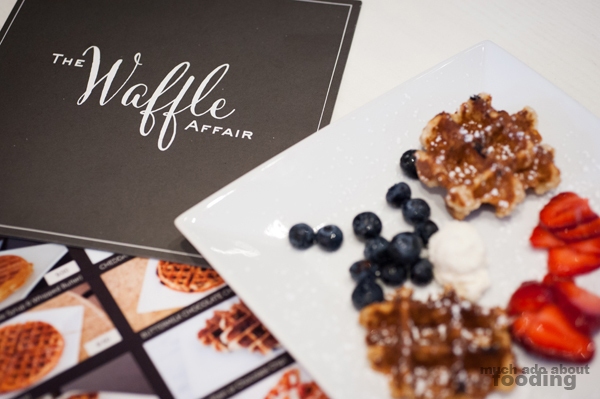 If you like denser waffles in Belgian style, you might enjoy The Waffle Affair - find them at 1064 Bayside Drive Newport Beach, CA 92660.